Big news in gaming this past week is that Google DeepMind turned its attention to another game and had a dominating victory, this time StarCraft II. But are we seeing the same sort of thing we did with Go and Chess? I’m not sure, and I am probably not going to look deeply enough to make a judgment, but I wanted to pass along a couple of links. For those who missed previous DeepMind adventures: Google has a machine learning setup that it is turning loose on games with amazing results. Go was long considered a space where humans would continue to beat computers because it has a very large decision space. As it turns out, no, modern computers can trounce that, and AlphaGo is the best player in the world, getting even better when it completely ignores the human history of playing Go and starts with only the rules, playing itself millions of times. AlphaGo was so good that human commentators could not see what it was doing and were laughing at its “mistakes” as it beat the best human players alive. Oh, it turns out humans have been playing Go suboptimally for hundreds of years. And then AlphaGo got better. StarCraft II is a similarly large next jump, a game without perfect information, in real time, with an even larger decision space. I can just point you towards the DeepMind AlphaStar post on it. AlphaStar can beat professional StarCraft II players, apparently pretty consistently. You can see more discussion from the team at their Reddit AMA. I found this counterpoint rather compelling. The argument is that AlphaStar is winning through superhuman clicking capabilities, not superhuman strategy as was the case in Go. AlphaStar was, so the argument goes, executing strategies dependent on perfect micro, telling individual units where to move and attack. AlphaStar will always win fights between even numbers because it can perceive and act quickly enough to target individual shots, and its strategic difference is favoring units where this advantage matters more in terms of perfect placement. I am not qualified to comment on the extent to which AlphaStar is making human-imitating spam clicks versus effective clicks. I do find it compelling to point out that AlphaStar engages in 1500+ APM at critical moments, particularly the example of having three units teleport simultaneously to three different points for an attack. Even if you were capable of perfect precision, I cannot see a human using the mouse and keyboard fast enough to do that … while also engaging in 19 other clicks in the same second. Being able to act without an interface and off camera is really big, and it is not the sort of mastery intended here. AlphaStar is intended to demonstrate human-equivalent or -superior decision-making. If it instead teaches itself to exploit human-superior clicking, that can lead to a win but not the goal, like the machine learning story about the computer who learned to win games by making the opposing computer crash. That is not winning within the game. In the end, though, this is probably the most important comment. Yes, there is a lot to be considered in terms of what restrictions the computer needs in terms of speed and accuracy, but ultimately this was the proof of concept. With more time and practice, we should expect AlphaStar to do amazing things within the game. And remember, AlphaGo got better than any human had ever been by learning from humans. It got better than that by learning on its own. Twice. Posted on January 30, 2019 January 30, 2019 Author ZubonCategories Real Time Strategy9 Comments on AlphaStar: Maybe? Once again, bringing you timely reviews of the hits of 2009! … wait, really, 2009? I must have gotten this in a bundle. I apparently have the “Grand Master Collection,” which I know I didn’t pay $80 for. I only went as far as the single player campaign; if online ranked play is still ongoing, I don’t really need those achievements. It’s fun as a small squad RTS. You do not have the usual RTS economic aspect. You just have four hero units, most of whom come with grunts that you can refill at beacons. It does not seem incredibly deep. It felt like the same thing across missions, without a big, visible difference between enemy factions. Maybe the differences are more apparent if you play as them. I played on normal (“Sergeant”) difficulty. It was rather easy. The ability to pull back and refill your units, costing only time, makes it very difficult to fail. And there are no time limits. I followed a recommendation to clear the map, rather than race to completion, because that gives you optional objectives and advancement is based on xp (kills) and loot (which can be cashed in for xp). That was presumably part of the ease, staying ahead of the leveling curve. The game has another snowball mechanic: do well to get more missions per day, with a side objective that increases your score there. Always do your first mission on Calderis, with that maximum side objective bonus, and you get enough missions to never worry about catching the defense missions before they expire. The humans vs. eldar vs. tyranids story feels a lot like Starcraft, even after throwing in “vs. orcs, too.” I am well aware of which IP came first, but it is hard not to see it. Can you imagine how much happier it would be to be Games Workshop if Warcraft had been a Warhammer game, and then Starcraft had been 40k? The pack I got also had “Warhammer 40,000: Dawn of War II – Chaos Rising” and “Warhammer 40,000: Dawn of War II – Retribution,” with bonus name length and punctuation. It looks like the game got up to six races by the end, any of which can run the campaign. Keen! But my overall feeling after the original space marine campaign was that the game was worth a few missions but not a whole campaign. The basic play was familiar and basic, and the fights did not have much variety to them. Again, they probably did with closer examination, but “attack move to shoot and smash things” covered most of the game, with some strategic redeployment and use of abilities. I ran the first few missions with the stealth hero in my squad, working on careful deployment and use of abilities. Then I realized that I could just smash through the enemy without much thought. If you like small squad RTSes, this has a lot of enemies to smash. This is your good grind. Heroes of the Storm does, however, occasionally set its ARAM mode as a mirror match, 10 copies of the same hero. These are never fun, combining the worst elements of HotS and LoL. These games are decided early but take too long to actually resolve. There was not a rating offer after my last one, so this post suffices. I uninstalled Heroes of the Storm and the Battle.net Launcher. I would rather never play again than ever play that mode again. And since the mirror matches are handed out at random, bye HotS. The brawl map of the week for Heroes of the Storm is Lost Cavern, HotS’s version of LoL’s ARAM. In many ways, it solves some of the problems with both HotS and ARAM. The basic problem of HotS has always been that minigames trump laning and fights. ARAM removes any objectives except team fights in one lane. ARAM is as random as the name suggests. Lost Cavern lets you pick from three heroes and shows you team comp while you do. Controlled randomness, rather than absolutel chaos. You can still win and lose on team comp, but not utterly and before the game starts. Friends at a LAN party were hitting Heroes of the Storm hard, so I joined them. Quick version: it is still a weak LoL clone that replaces the toxic community with one that is silent. It is hard to tell whether the skill ceiling is that low or players are just that casual and disengaged. When you play support frequently, you really get a sense of how random folks can be. I assume it still has a significant playerbase? I have found multi-minute wait times for quick play, which to me would imply “dying,” but maybe my account is at a weird point in the population density. Overwatch feels similar, a shiny but somewhat clumsy TF2. Again the silent community and surprisingly long wait times. I assume the latter are not caused by my account level; I assume there is no matchmaking at all, given that I will end up in games with level 100+ pre-made groups, despite being relatively new. Blizzard codified the trope of “soloing together,” and this is what it looks like in a team game. On the other hand, if you can get a few people working together, that will wipe the map. Fish, barrel. Posted on January 17, 2017 January 28, 2017 Author ZubonCategories Overwatch, Real Time Strategy, Team Fortress 24 Comments on Heroes Alive? I love and fear asymmetric PvP. It is so hard to balance well and so good when it is done right. There is something satisfying about being the big monster fighting several of your friends, or being that group of friends taking down a big monster we know to have a capable pilot. About pitting goblins against elves against dragons. About ninja and samurai, pirates and ninja, merchants and pirates. Symmetry is elegant and much easier to balance, but teams with different advantages and disadvantages add so much more color. But it is so easy to get wrong, and if you mess it up, it may not be fixable. Or maybe the balance really is perfect, but not in your local gaming group, where one person is especially good with one strategy and makes all the other factions look like trash. It is hard to tell whether the im/balance is in your game or your gamers, and imbalanced gamers can lead to runaway differences in-game. I see the latest thing on Kickstarter or Steam, and my interest is piqued, but it will take many hours of (hopefully someone else’s) play to see whether the game has the chops to make it work. A bit of randomness in the game can hide imbalances for a long time, and really for as many times as I am likely to play a game, “close enough” is probably good enough. I finished playing through Evil Defenders. It is a tower defense game for PC or mobile; I played PC. It is somewhat entertaining, but either you like tower defense and have already played better or have not and should play better. If you liked Kingdom Rush and want more levels of a worse version, pick this up on a sale. There are fifteen levels each at six difficulties. You will need to go through most of those because the upgrade costs were set with mobile microtransactions in mind, please buy more souls. But if you play through the assorted difficulties, the game is not especially difficult, as the upgrades come faster than the difficulty. The game’s achievements are kind of bad, which is an outgrowth of the grindy mindset. I decided to play through the whole game, all difficulties, and like the person in the linked thread I have 3 achievements left that will take hours of repetitive play to complete. Their estimates are a little high, because you could “efficiently” grind a high-yield map, so I timed that and estimate it would take 15 hours of playing that one map 90 times to complete the last few achievements. No. Even getting 1 more achievement would take 3 hours. Still no. Global stats tell me that 2% of players have that last achievement, so I hope they were cheating rather than spending a literal day farming kills. If the game had an endurance mode, and I could leave it running overnight, that might be doable, but no. Getting all the achievements is not the point so much as using the achievements as a guide to what the developers are thinking and doing. In this case, they made 15 levels and are trying for fake longevity by adding on repetition. Grind souls to get your upgrades, repeat the levels six times each, and if you want your 100% completion, play for another entire day. On the one hand, this really does feel like an achievement. On the other, the fact that less than 1% of players have beaten the game in hard mode should have told me something. I got a month’s worth of play out of GemCraft: Chasing Shadows, which is about as strong an endorsement as you can give a $2.49 game. I dare say you’d get your money’s worth at full price, if you are the sort that likes tower defense enough to play through 100+ levels of it. Looking at my Steam friends list, I am a far far outlier in terms of how much this was worth to me. Having played previous versions of GemCraft as a flash game, the big takeaway for me was the magnitude of the breakthrough reminding me that reaching a higher level is more significant than optimizing lower levels. I would like to thank the GC:CS players in the reading audience who did not pat me on the head condescendingly when I was proud of getting past wave 100, when that is still the early game. 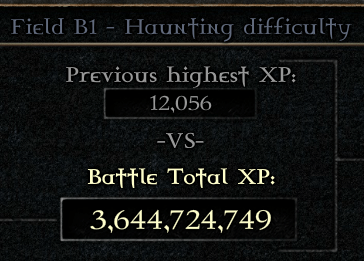 The image to the right expresses the change in magnitude, and that 3 billion xp came from a map where I went AFK and just let it run for a while. Getting ahead of the xp curve was valuable, but the hour I spent carefully maximizing a level in the middle of the map would have been much better spent zipping across the map to get to the point where I had all the skills and difficulty dials. Getting one million xp is helpful, but it took an hour to do it around level 200; once you get your full suite of options, you leap to level 2000 and can earn more than a million xp in a second. Water finds its level, and you profit more by finding your level than by trying to perfect each level along the way. Granted, being really good at one level is usually how you reach the next one, and we gamers have a long history of optimizing the fun out of our games, so I am open to counter-arguments here. There are only 3 achievements left that are not “defeat level X with a self-imposed handicap” achievements, so I may take a victory lap through those levels and see if I can pick up the 2 non-level-specific achievements along the way. The last achievement challenge is Iron Wizard mode, re-doing the game without being able to out-level the difficulty curve (although also with no reason to perfect levels beyond “just finish”). I don’t know if that sounds like fun or drudgery. I do not think I will be joining the players at the “extreme end game,” even though I am reaching that level 3000 range where it opens up. At that point, you’re just seeing how much you can abuse the math behind the game, which sounds fun but I’ve served my time. I accidentally beat GemCraft: Chasing Shadows last week. “Accidentally” in that I was pursuing my new playstyle of sprinting through levels in search of all abilities when it turned out that one of them was the official end of the story. I’m not sure how much I can spoil a story that fits on one page or how much the story of a tower defense game matters; it ends with the same tone as the first game. The story-ending level does combine a few mechanics we’ve seen across the game, rather than being a standard level. So that was kind of interesting. Something seems wrong with being able to beat a game on accident, especially given how this series makes beating the game a loss. There are epilogue levels, plus all the levels you didn’t play or can play again for more waves and at higher difficulty. For tower defense, like FPS, the play is the thing, so it’s a matter of for how long the gameplay stays interesting (and you still have a sense of achievement). And then there’s Iron Wizard mode, beat the game again without being able to out-level the difficulty curve.